Advanced treatment for varicose veins using endovenous glue and duplex doppler ultrasound technology. Recent studies have shown that endovenous glue is not inferior to other modern varicose veins treatments like Venefitand causes less pain, less bruising, fewer complications and a better quality of life. Can glue be used to treat Varicose Veins? The Venaseal™ procedure is a minimally invasive in-office treatment for varicose veins and Chronic Venous Insufficiency (CVI) in which a vein specialist inserts a Venaseal™ Endovenous Catheter to deliver glue, collapse and close enlarged leg veins. 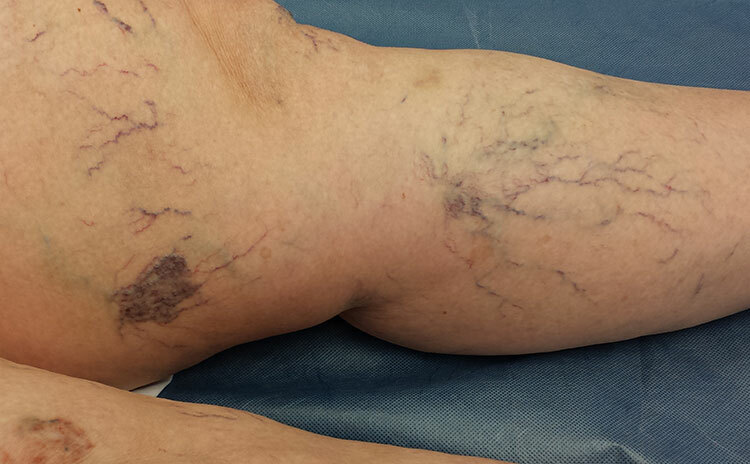 After the vein is sealed shut, blood then naturally re-routes to other healthy veins in the leg. The Venaseal™ procedure is performed in an office operating room under local anesthesia, minimal preparation by the patient is required. It truly is a walk-in walk-out procedure that takes 20-30 minutes to perform. There is no need for hospitalisation or a general anasthetic. To perform the Venaseal™ procedure, Dr Blignaut maps out the leg veins to be treated prior to surgery using a duplex ultrasound. During the procedure, a small needle is inserted just below the knee. (This needle is the same size as a regular drip in the arm). This needle is replaced by a plastic cannula that allows for the passage of the Venaseal™ catheter into the vein. No further injections are required. Once the catheter has been palced by ultrasound, a precise amount of glue is delivered to the vein. Mild pressure allows the vein to be glued shut immediately, leaving a sealed vein. Upon completion, the catheter is removed from the leg. Most patients experience minimal discomfort during the procedure and no pain afterwards. For anxious or needle phobic patients we use a mild sedative prior or during the procedure. Even the most phobic patient can be comfortably treated. Patients leave the room once the procedure is complete. If no sedation was used, they may drive themselves home. You will be encouraged to walk everyday, but to refrain from strenuous activity for at least a week. Most patients who undergo Venaseal Glue treatment of their varicose veins typically resume normal activities within a day. Is Venaseal Glue treatment right for me? 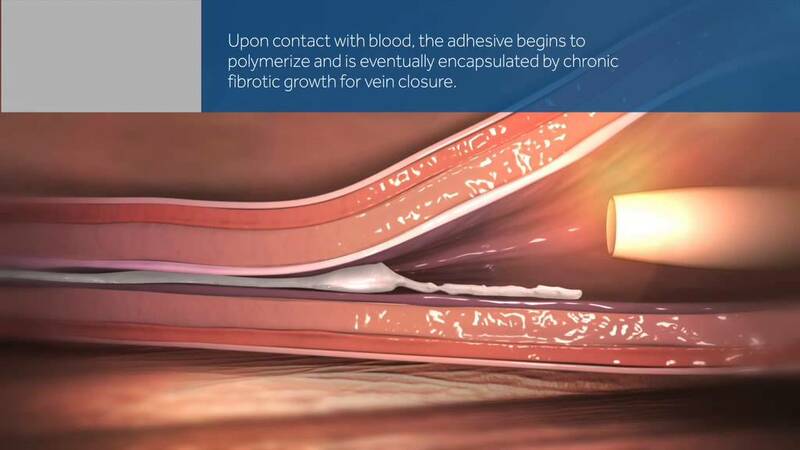 Endovenous chemical ablation procedures like Venaseal™ has replaced the old stripping surgery. Vein stripping surgeries date back to 1905, and has been long overdue for a complete overhaul. Vein stripping surgery is a traumatic experience for both the patient and surgeon. Clinical outcomes after surgery is often poor with a recurrence rate as high as 60%. Dr Blignaut does not offer vein stripping surgery to his patients, as this barbaric procedure should be religated to the history books. Patients with superficial vein reflux, as demonstrated on a duplex scan, are ideal candidates for this procedure. Patients with deep vein reflux, usually due to an old DVT are often not candidates for this procedure. 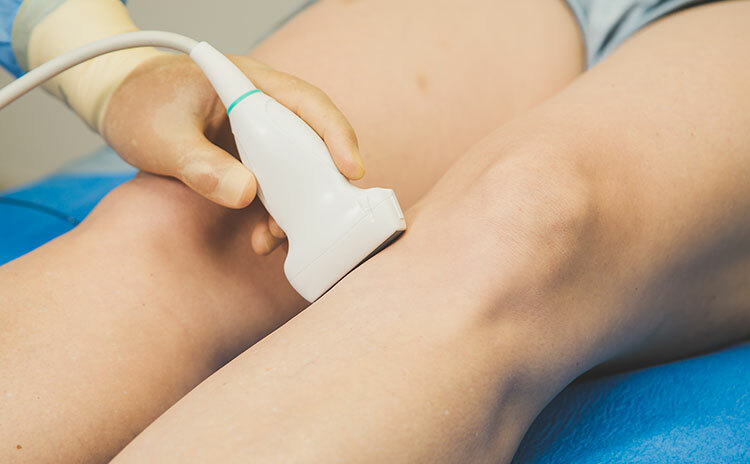 The only way to determine if you are a candidate to have your veins treated by Venaseal Glue, is to have a duplex scan done by a vein specialist. Venaseal treatment is still very new. The Venaseal™ Glue procedure is NOT funded by most medical schemes in South Africa. Medical aids like Discovery do not fund the Venaseal procedure. This means that you would be required to pay for the procedure. For more specific information on medical schemes and pricing, please contact us.